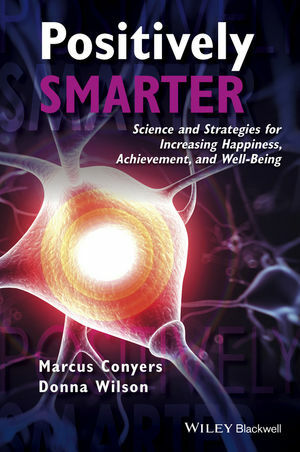 Positively Smarter brings together seven principles for connecting the science of neuroplasticity to practical strategies for enhancing the synergy of happiness, achievement, and physical well-being. Moving beyond common myths, the text builds an evidence-based paradigm to empower readers to take practical steps to move forward. Marcus Conyers and Donna Wilson are codevelopers of curriculum for the master’s and educational specialist degrees with majors in brain-based teaching and a doctoral minor in brain-based leadership with Nova Southeastern University. They are authors of numerous books including, Five Big Ideas for Effective Teaching: Connecting Mind, Brain, and Education Research to Classroom Practice (2013). Marcus Conyers is founder of the Center for Innovative Education and Prevention and an international speaker on increasing higher-order thinking skills, achievement, and well-being. Donna Wilson, PhD, is an educational psychologist and teacher educator who completed postdoctoral studies in structural cognitive modifiability. Former chair of education of the University of Detroit Mercy, she is an adjunct professor at NSU.